While I was in Los Angeles recently, I was having lunch with a couple of girlfriends when one of them told a story that had us sitting on the edge of our seats, incredulous and enthralled. It was a love story. A story of great passion and romance that many dream of but few experience. A story of two people who had a crush on each other in their early teens, lost contact and reunited later on. So why the incredulity and wonder at this story? Surely that’s not such a big deal? Well it is when the gap between their first knowing each other and meeting up again is sixty five years! Yes that’s right, sixty five years! They had completely lost contact after knowing each other at the age of thirteen in Rio in Brazil where they were both born. At the age of thirteen this was the most innocent of loves, unfulfilled, unconsummated in any way, and shaped by young inexperienced emotions. After losing contact and ending up living in different countries, they went on to have a number of marriages and children and grandchildren between the two of them. Then by chance, an email via a third party put them in touch again at the age of eighty! What began as correspondence by email, catching up on all that had happened in the last sixty five years, remembering the happy times from their childhood, something began to blossom. The realisation that they had always held a place for each other in their hearts, had never forgotten each other, that each had been the ideal of the other without consciously being aware of it. Something was being re-ignited even though they had yet to set eyes on one another. They hadn’t even heard the sound of each others voice in sixty five years. Then the phone calls began and they quite simply fell head over heels in love. And so began this amazing love story between two people who were both in their eighties. They were taken aback by the passion, excitement and youthful enthusiasm that seemed to be overtaking them. The big test would be if they met face to face. As she was living in California and he was living in Brazil, this involved a long flight. The day dawned when Juan flew to Los Angeles and Evelyn went to the airport to meet him with a mixture of great excitement and yet nervousness that he would see her, not as his great love, but as an old woman. As he emerged from the terminal and they set eyes on each other for the first time in sixty five years, they each recognised their soul mate. And so began a love affair, both physical and romantic, that anyone of any age could only dream of. Evelyn had been a journalist and writer for many years and she went on to write a book about their love. 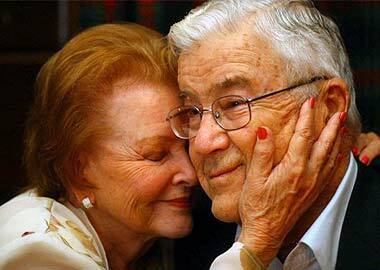 Sadly at their age, this was not to be a long relationship but one that brought them so much happiness and youthful joy. It’s a story so inspiring and a reminder that love truly is ageless. That inside each person, no matter how young, how old, how wrinkled, or however any physical thing you can think of, our essence and our being remains pure and ageless. Evelyn is the mother in law of my friend that told the story who kindly gave me the book to read. It is one that is hugely romantic and poetic, one that fills you with hope and possibility and is ultimately a lesson. Evelyn is such a wonderful spirit, so open to the world and all it has to offer. We could all learn a lot from Evelyn. And of course, from her wonderful Juan. The book was an absolute joy to read! So incredibly romantic and quite hot! Loved it, thanks!